This is an entire specialism, requiring years of training. A brief overview follows. Diagnostic work requires low energy, short lived isotopes. When the objective is therapy, i.e, to irretrievably damage cells such as the rapidly growing cells found in tumours, high energy beams are used, either high beta, X or gamma, energies in excess of 1MeV, usually, whose energy/penetrating power characteristics are well understood. The objective is to irradiate as much of the affected area as possible without damaging healthy tissue. Rapidly growing tissue is much more radiosensitive (able to be damaged more easily) than normal tissue, which is why diagnostic X rays are prohibited for pregnant women since the rapidly growing cells in the foetus are highly sensitive. A high dose of I-131 can be given which accumulates in the thyroid and destroys the cancerous cells at the expense of a very high healthy thyroid dose. Cs-137 needles can be implanted into small plastic eggs and inserted for a predetermined period at the head of the cervix to knock out cervical cancer cells. Co-60, is artificially produced by slow neutron capture of Co-59 in a reactor, has a half life of 5.3 years – a long half life is preferred so we don’t have to replace the source very often. It is a beta emitter , decaying to Ni-60 and can be used in preference to X-rays to focus, or better, collimate a beam on to a particular area of interest with lead collimators – often to treat areas just under the skin and often from several different angles to maximize dose on the area of interest while minimizing it elsewhere. 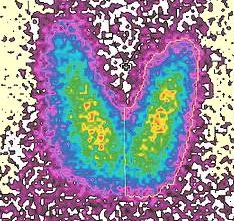 The activated nickel nucleus emits two gamma rays with energies of 1.17 and 1.33 MeV. A Co-60 source with an activity of 2.8 GBq, which is equivalent to 60 micrograms of pure Co-60, generates a dose of 1 mSv at one metre distance within one hour, a very significant dose for therapy. As with all treatment machines, this modern X-ray treatment machine is clearly rotatable. Calculating dosage is highly complex and in this example, the machine orientation and exposure times will be calculated with an onboard computer. 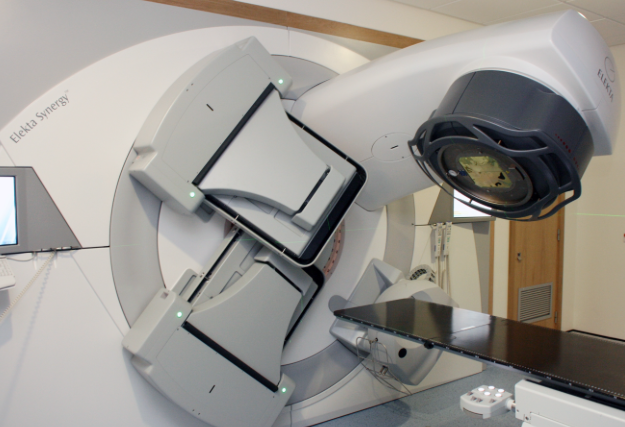 Radiotherapy is frequently used with chemotherapy to provide a cocktail of mechanisms to destroy cancers. It should be pointed out that cells are not “killed”. Their functions are impaired because their proteins are damaged by ionisation, hence they fail to fulfill their metabolic functions. Enzymes are misshapen hence cannot bind to substrates properly, nucleic acids can no longer accurately replicate and so on. Biological Effects of Radiation. Dose and Dose Equivalent. If exposed to ionising radiation, macromolecules which rely on precise conformations are damaged, change shape and don’t work. DNA and other nucleic acids can’t repair themselves and replicate nonsense proteins. Irradiating water produces highly reactive free radicals which have biological implications since water is a universal solvent. Damage H produced is in “dose equivalents” since the ionising damage is dependent on radiation type. Q is a quality factor , a dimensionless integer, 1 for betas and gammas, 20 for alpha particles. H is measured in SIEVERT (Sv) – also J/kg, where 1Sv = 100 rem – the old unit. Maximum permissible dose is a dose level applied to workers in the radiation industries, including hospitals, and is about 50mSv per year from a variety of background sources, chest X-rays and so on. Workers are regularly monitored in hazardous environments. A dose of 5Sv is huge – causing massive tissue breakdown, consequent internal bleeding, and death within about six weeks. Some Hiroshima victims may have received as much as 100Sv. It was said that if you survived the first three weeks, you might just pull through. where f is a quality factor – a dimensionless integer dependent either on photon energy or the material receiving the dose, and sometimes both. This subject is vast and growing, so we’ll just take a very quick look. Non-toxic especially if a non-metabolite. There are very many techniques routinely used and new developments happen frequently. Here’s a few examples. The ones in red are medical applications. 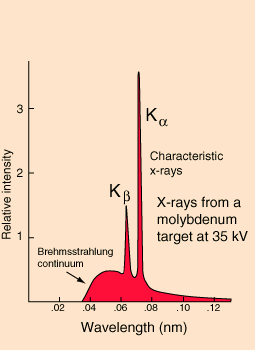 Technetium – 99m: The most widely used radioactive isotope for diagnostic studies in nuclear medicine. Different chemical forms are used for brain, bone, liver, spleen and kidney imaging and also for blood flow studies. M = metastable. Eluted (milked) as sodium pertechnetate from a molybdenum “cow”, it has a convenient half life of 6h and energy a useful 140keV. 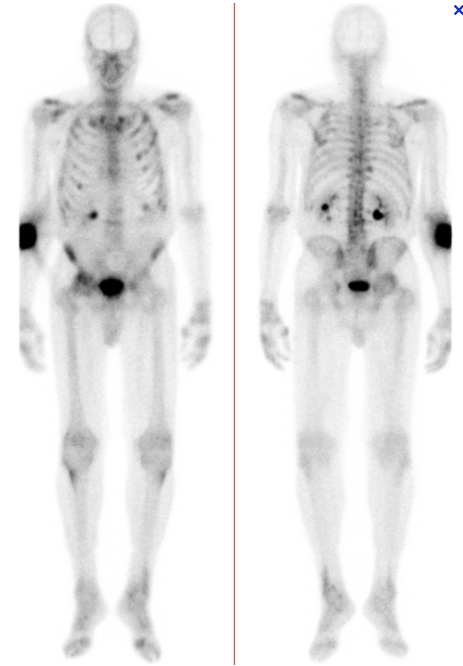 An injected dose of the radiopharmaceutical is then able to either be followed around the body (dynamic renal studies), uptaken into an organ which can be externally imaged with a gamma camera or blood protein metabolism when tagged to serum albumen studied by repeated sampling later and measurement of radiation content in a scintillation counter. 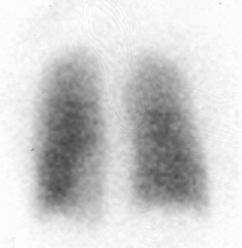 The reduced uptake – cold spots – in this Tc 99m bone scan are clearly visible. 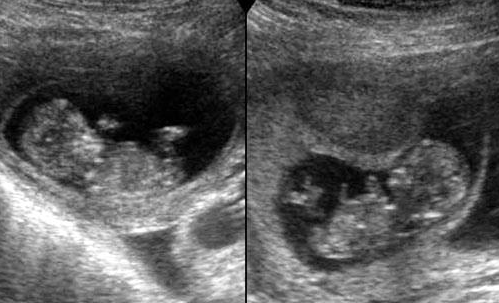 The later image is on the left – notice the fuller bladder. A small quantity of the isotope is given orally as dilute sodium iodide. The thyroid uptakes the iodine exclusively to metabolize two hormones which regulate iodine metabolism in the body. A scintillation detector is used to measure the count rate over the gland after specific time intervals, from which important diagnostic information is obtainable. A deficiency or overactivity in production causes characteristic symptoms which require either surgical or biochemical intervention. In much larger doses, iodine 131 is an effective agent for treatment – its ionizing properties are restricted to the surrounding thyroid tissue and renders cancer cells ineffective. In conclusion – questions needn’t necessarily be restricted to these two. For example, Xe 133 is completely inert and has a very short half life. Patient takes a deep breath infused with a small quantity of the isotope, stands in front of the gamma camera for a few seconds and a lung perfusion image is created. Here’s an image of two healthy lungs with no cold spots. 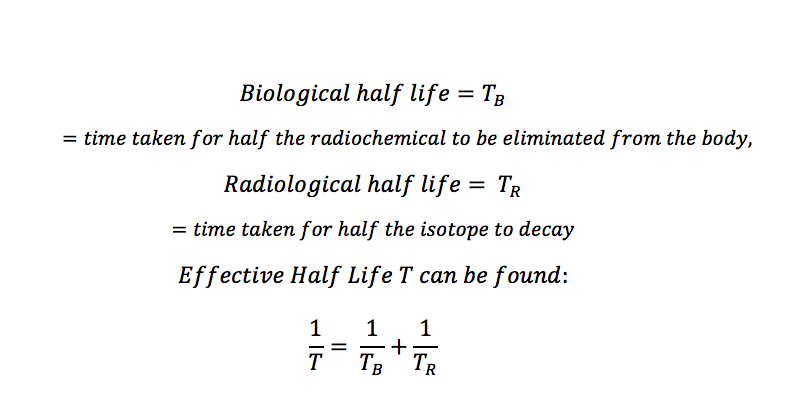 So, if iodine 131 has a radiological half life of 8 days and a biological half life of 24 days, the effective half life is 6d. Exam questions about this are sometimes comparative. X rays are more invasive since they cause ionization. Ultrasound (US) is a non-invasive procedure causing minimal local heating which relies on the fact that sound waves well above the range of human hearing are reflected at a boundary, such as that between bone and air, for example. The greater the density difference between the two media, the higher the percentage reflected back and vice-versa. When an AC source of very high frequency is applied to a piezoelectric crystal (even quartz works fine) it vibrates, creating an ultrasound wave at the same frequency as the AC. The sound produced is then directed at an object and then bounces back off the object under investigation. 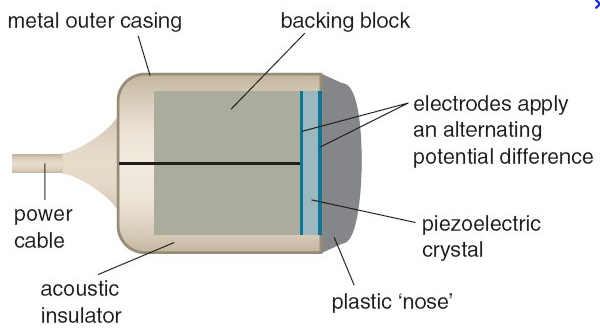 When the sound wave comes back to the piezoelectric crystal, it has the reverse effect – causing the mechanical energy produced from the sound vibrating the crystal to be converted into electrical energy. By measuring the time between when the sound was sent and received, the amplitude of the sound and the pitch of the sound, a computer can produce images, calculate depths and calculate speeds. We recall having previously mentioned specific acoustic impedance, Z, the product of material density and velocity in the medium. This is worth a moment’s thought, since it suggests the most reflection, hence largest signal received, will happen when the sound is reflected off the interface between two materials of very different densities. In obstetrics, if a coupling gel were not used to move the transducer across the patient’s abdomen, apart from the lack of lubrication, all the sound would be reflected and none transmitted into the body. This “acoustic coupling” is vital to ensure that most of the sound isn’t reflected back and so gets past the air/skin barrier. Retinal detachment can be detected using high frequency US, as shown. 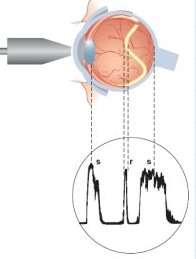 In a healthy retina, the middle spike should be absent but because the retina (yellow line) is not attached to the eyeball surface and is floating in the fluid in front, an echo is seen as the US bounces off it. 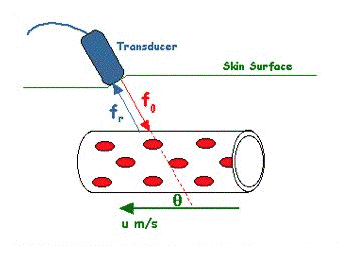 B scans are multiple A scans, produced by a moving transducer. They take many A images per second and an image intensifier – these days a computer – retains and displays the information in real time, building up a 2D slice across the transducer’s moving path. It is a routine procedure in obstetrics where the transducer is moved rapidly over the abdomen from right to left and back again a few times so as to collect enough data to build up an image. This image shows twin foetuses. I think it likely that they will ask for comparisons rather than specific detail.MRI is the only one not using X rays so patient dose is the important factor. Image intensifier screens (fig I2.7) allow the production of an image changing in real time, which can be advantageous, particularly when used with high contrast material like Ba which shows the passage of barium sulphate through the gut, for example. It does, however, subject the patient to long exposure times, hence high radiation dose. Since the objective is to minimize this, we look elsewhere for more sophisticated techniques. X-rays (short wavelength, high energy EM radiation) are produced when charged particles like electrons are accelerated around nuclei. Since they are negatively charged, they are accelerated towards a positive nucleus, emitting as they curve around a ‘braking radiation’ or‘bremsstrahlung’ in German. The degree of ‘bend’ determines the energy of the X rays produced, so the radiation emitted is over a continuum of wavelengths . Additionally, the electrons may directly promote other electrons in the metal atoms of the target from its lower to higher energy levels- when these decay back they emit characteristic X-photons. Here two characteristic jumps are superposed on the bremsstrahlung background. The relative intensity is a measure of how likely this event is. Characteristic X peaks for Mo. Notice the short wavelength cut-off corresponding to the electron delivering all its energy to forming an X-ray. We won’t go into details here, except the only real difference between these and gamma rays is that gamma rays are emitted spontaneously from excited nuclei. X-rays pass through human tissue, being selectively absorbed by denser material. In 1901, Wilhelm Roentgen was the first person ever to win the Nobel Prize for Physics and his discovery revolutionised the medical world. Some schools have a small version of one of these. Electrons are accelerated in a vacuum towards a metal target, W in this case. X rays are produced – notice they are not subject to a ‘law of reflection’ – and pass through and out of a collection window for use. At diagnostic voltages (140KV for a chest X-ray, lower for dental use) the anode gets very hot and has to be cooled, the target is often rotated otherwise the heat generated would destroy it. 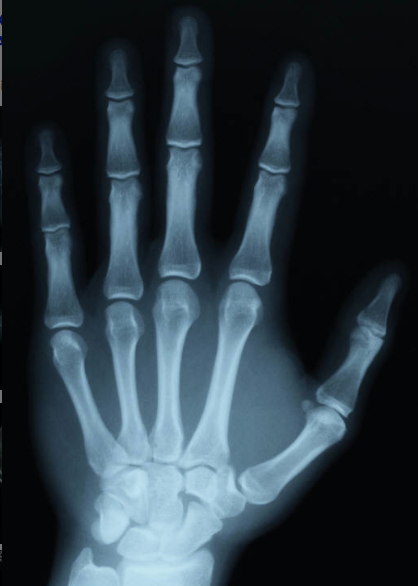 The X rays are partially absorbed by the area of interest in the patient and the data is collected on photographic film as a negative image where high absorption is seen as a light area and vice versa. The mechanism for energy loss in the body is photoelectric. Since this effect is strongly dependent upon Z, there is substantial difference between Z(bone), about 14 and Z(soft tissue) about 7, so X rays are good at contrasting bone and soft tissue but not very good at contrasting between different soft tissues since their Z values are too similar. Increasing the sharpness of the shadow gives better diagnostic information. 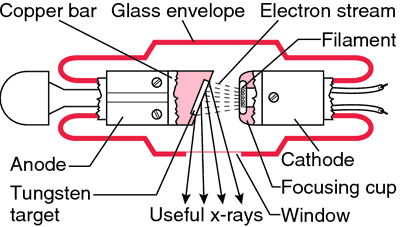 We can’t ‘focus’ X-rays using a glass lens like we can with visible light so we have to arrange for rays normal to the film only to fall on its surface since scattered rays will blur the image. There is a section on p703-4 which explains how this is achieved by filtering and lead grids – a possible exam question. There are three ways. Which one depends on the initial photon energy. At higher photon energies, such as with X rays, which penetrate further into the electron cloud an inelastic event may occur, called Compton Scatter. A free electron takes up part of the photon energy, the photon is scattered or re-emitted with a longer wavelength and the difference is in the kinetic energy of the electron scattered in a different direction. 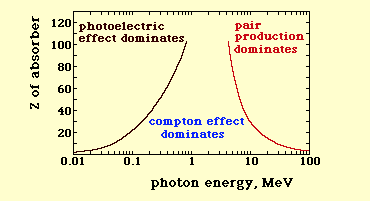 By contrast to the photoelectric effect, Compton scatter doesn’t vary much with incident photon energy, but increases linearly with atomic number. 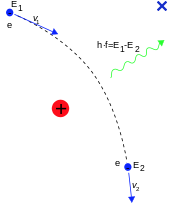 A simplified diagram shows the scattered electron as a black arrow. At higher energies still we see Pair Production being dominant, close to the nucleus, where the photon is converted into an electron-positron pair which then annihilate to produce two identical photons. NB: all other conserved quantum numbers (angular momentum, electric charge, lepton number) of the produced particles must sum to zero – thus the created particles have opposite values to each other. The lowest energy of the incident photon must have higher energy than the sum of the rest mass energies of an electron and positron (2 × 0.511 MeV = 1.022 MeV) for pair production to occur. So, at low Z and relatively high energy, mostly Compton scattering, low energy and high Z means the photoelectric effect predominates and high energy and high Z means Pair Production. Notice the logarithmic scale on the energy axis.